Well hello there. It has been forever and a day since I blogged, but I am happy to be back. After a very long break from cardmaking, I am finally starting to feel the urge to get crafty again. I recently discovered that an artist I've long admired, Wendy Burns, now offers digi images at her All Dressed Up Stamps Etsy shop. I truly adore her work. Her designs are right up my alley, so naturally I had to pick up just a few. The All Wrapped Up digi image was colored using Copic markers and then paired up with a variety of gorgeous My Mind's Eye Collectable Unforgettable patterned paper. The "you" die cut and coordinating clear stamp set are from Simon Says Stamp, my current go-to source for clear sentiment stamps. The yellow felt flower was created using the My Favorite Things rolled flower die, and I think it added a fabulous little touch. 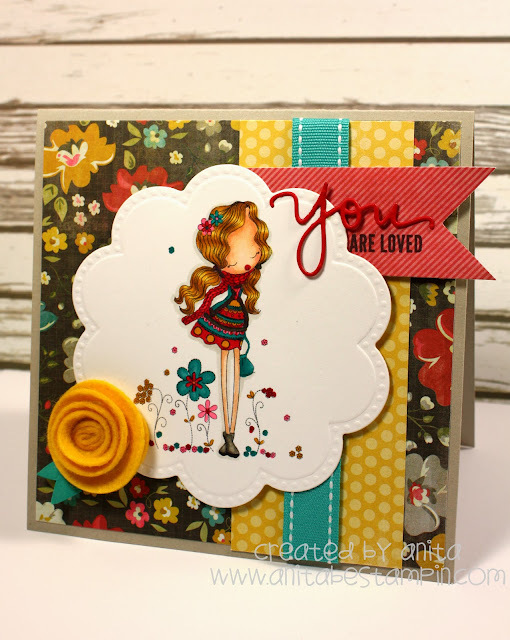 I was inspired by Karen Giron's Sweet Sunday Sketch #197 and am planning to enter this card in the challenge. This card will also be entered in All Dressed Up Challenge #4 where the team there challenged participants to use Ribbon and/or Lace. I hope you like my long overdue crafty creation. A beautiful card Anita, welcome back to blogland sweetie. Love your card, all those colors are great. Thanks for joining us at All Dressed Up. It's so great to see you back in the crafting game!